Down the road where I live, I often see a gang of men, hanging out at the footpath like it’s the most normal thing to do. Nobody would give them a second glance or thought. Replace boys with girls and the picture changes entirely. Suddenly you have everybody’s attention and you are definitely being stared at with distaste. I wonder what really goes on in the head. These girls are behaving like boys! Don’t they have any shame? Don’t they realise everyone is looking. So? anyone (that includes women as well) is allowed to move freely in a public space. It’s equally accessible to both, men and women. Sadly, that’s not an instinctive thought. Taking this issue up, five women from Pakistan have come together to create #GirlsAtDhabas, A social media project that started off on Tumblr and now is a Facebook page as well. Their goal is simple – to encourage women to increasingly occupy public spaces, that they wouldn’t otherwise, without hesitation. 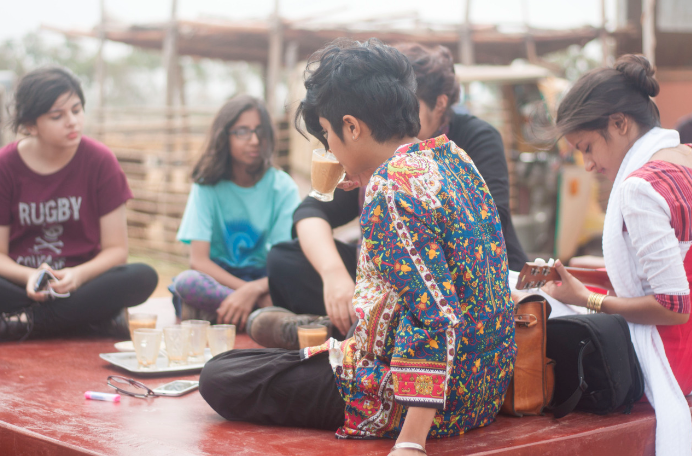 Share a picture of yourself at public spaces, with Girls At Dhabas via Tumblr and Facebook. After a few posts from the girls themselves (Sadia Khatri, a journalist from Karachi is one of them), the project evolved into a crowdsourcing inspiration through entries from Karachi, Rajasthan, Punjab and Lahore. In a way, users were actually running the page and keeping the momentum going. Delving deeper into the topic, the question of class and socio economic backgrounds came up as well apart from the right to occupy these spaces. This project that was always executed online started off as a blog on Tumblr. Extending itself to Facebook will help strengthen its presence considering the reliability of this platform. Everybody is on Facebook rather, everybody knows Facebook. One basic like/share/comment on a user’s end appears on the newsfeed of their peers’ which in turn will be noticed by their peers. This chain reaction, although small could work in the favour of Girls At Dhabas. Additionally, with the launch of the ‘Donate Now’ button, Facebook is making sure, social causes can be actioned immediately, at least those that require donations and urgent funds. This move might just be the beginning for all causes that can now find a serious voice (whether they require funds or not) on this social networking site. As a page, they are not looking to mining likes but to send out a message. In fact, one of the founders of Girls At Dhabas extended the movement in the form of a cricket match on the streets. 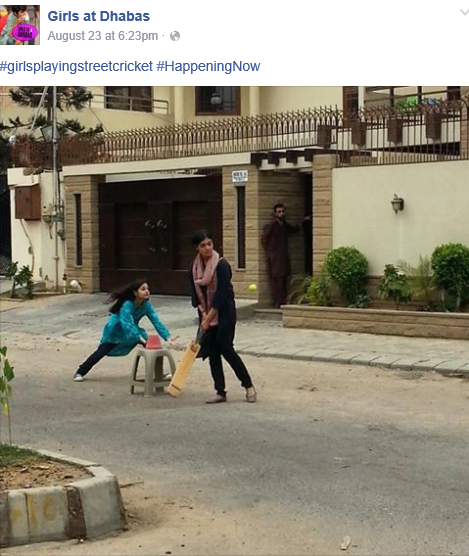 During the match, 15 girls bowled, batted and ran across the street, experiencing public space like never before. Even when garnering likes is not the main aim, it’s important to understand the magnitude of social media for such causes to spread seamlessly. In Afghanistan, social media impact was realised when an incident of a murder of a 27 year old woman took place outside a Mosque, since she dared to argue with a mullah. A video of the incident was shared on Facebook which let people know what actually happened. The end result of the trial was not ideal but now everyone wanted to fight for her. Social media became a strong voice, that too in a developing country that wouldn’t tolerate any progressive actions. That’s the echoing effect of social media that Girls At Dhabas may need to scale up their social issue. Considering, most of their participants are local (Karachi, Lahore) Girls At Dhabas could enter the global landscape with a few basic steps. Like the street cricket event, the girls could continue to extend the movement in the form of various events that reiterate the issue strongly. Other platforms – Apart from Facebook and Twitter and Instagram, Snapchat is another growing platform where the LIVE feature could be put into use on particular occasions (Humanitarian Day, Women’s day) by creating a collation of live feeds of their events. Their largest audience are millenial, which is why Snapchat could be an effective option. Periscope is another medium through which Girls At Dhabas could share live video feeds. The freedom of mobility is a quiet yet a powerful right. The picture needs to merge seamlessly now, with no differentiation in gender. It began with dhabas, hope it ends at the streets, the pavements, the footpaths, the tapri shops, every place a woman would hesitate to occupy. 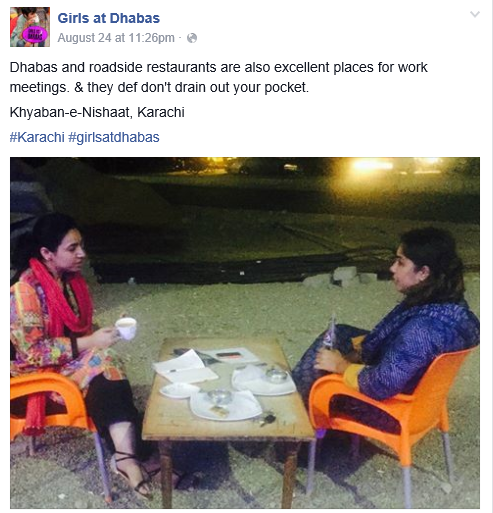 Personally, I hope Girls At Dhabas manages to pen down a story that ends with no stares/surprise. Idealistic? Yes. But I want to be a in a world where ‘desi feminists define public spaces on their own terms and whims’.